Does quantum physics relate to the Bible? 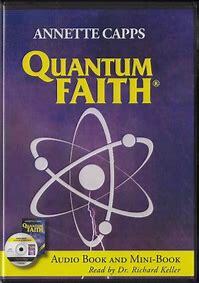 There are amazing similarities between physics (quantum theory) and the teachings of Jesus. The concept of speaking to mountains and trees may not be religious metaphors, but the newly discovered laws of quantum physics. There are amazing similarities between the teachings of Jesus and the discoveries of the new physics at Lawrence Livermore Labs. Jesus taught that our words are powerful enough to move physical matter. Quantum physics shows that subatomic particles respond to the observer. In the book below you will discover that your words and your faith (beliefs) are unseen forces that affect everything in the your world. You are the one giving substance to your world through words! '''Self-talk''' audio programs were first professionally produced by Dr. Shad Helmstetter in 1981. Throughout their more than thirty year history, Dr. Helmstetter’s recorded '''self-talk''' programs have remained the worldwide source for positive '''self-talk''' programming. Today, '''self-talk''' digital download sessions are listened to by tens of thousands of individuals in every area of life. To help you on your journey with '''Self-Talk''' your Certified Life Coach offers you the accountability you need. * Are you ready to stop feeling overwhelmed from the daily tasks at hand? * Do you want to have an amazing masterplan? * Are you ready to have high self-esteem? * Your doing okay, but you know you could do better. Answering yes to any of the above statements suggests that you would benefit from better '''Self-Talk''' and some Life Coaching. We educate, motivate and help people positively talk. ~upbeat~transforming~life changing.